If you have ever read The 5 Love Languages by Gary Chapman, then you know that one of the 5 love languages he writes about is words of affirmation. While this isn’t mine or Chris’ primary love language it is one of the ways that we all fell loved. I’m not very good at giving verbal words of affirmation. 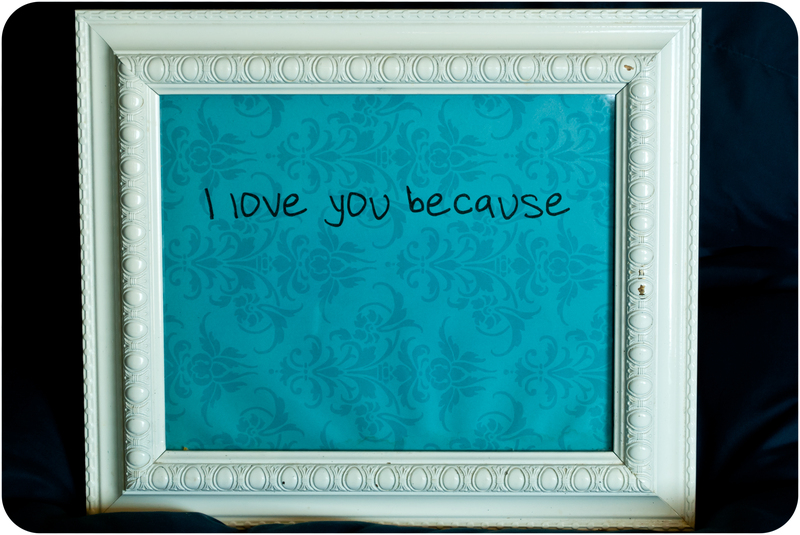 It’s easier for me to write things down so a few years ago I made this: It’s just a frame, that I spray painted white, with some scrapbook paper in it on which I printed out “I love you because”. Then we use a dry erase marker to write messages to each other. It’s a simple idea really, but one that we have enjoyed over the years. We actually keep ours in our master bathroom (so romantic right?). I do that for many reasons. First, it’s not something that I want visitors or other people reading and very few people go into that bathroom. Second, the bathroom is somewhere that we both frequent so you know the message will be viewed. Lastly, sometimes when you are in the bathroom you have a little time to sit and think about the many ways that you love your spouse. This is a little gesture of love that can sometimes go a long way. 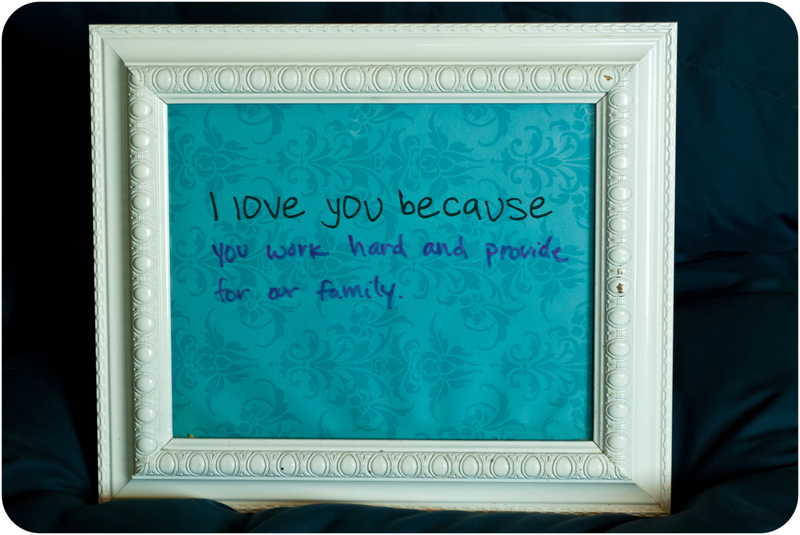 Last week my husband gave me one of the nicest compliments that I’ve ever received and it was written on this little board. He wrote, “If more women in the world were like you there would be far less problems and far greater men.” I’m not sure how true that is in general but it’s sure nice to know that he thinks that. Like I said before, it’s a pretty simple idea. Simple to make and simple to use but sometimes it’s the simple things in life that make a big difference. I’m sure his compliment is true. And I love that you do that! I admit that I saw this board once (I feel like it was a couple years ago, I’m not sure) when I was forced to use your bathroom (I really don’t remember why I used yours instead of the main one, but I promise there was a good reason!) and it made me smile so much. At that time, there was a note from Chris to you. I won’t say what it was, but it was so sweet, it actually made me focus more on saying nice things to Bart. I never told him about it, but now that I’m reminded of this, I really think I want to steal this idea and make my own little board.